Actual news today (for once), along with a legitimate reason to dish out congratulations to my good friend and former roommate, Pete, also known as Squawking VFR. Apparently, he and Mrs. VFR are going to be visited by the stork* at some point a handful of months in the future. Congratulations, kudos, and mazel tov to the both of them, as well as to the Browns-fan-to-be (not pictured, but also pictured). I received verbal confirmation of the blesséd news yesterday afternoon while the VFRs were approximately 40 miles west of Cleveland. Prior to that conversation, I had suspected that the t-shirt pictured above was part of a hoax. I could see these two pulling a stunt like that. Some advice for the unborn VFR: this would have been a good time for you to orient yourself with respect to the geography of northern Ohio, where you are certain to spend more than a handful of Sundays long before you reach Selective Service eligibility. Your father, who once decorated half of my college dorm room in the stunningly attractive color scheme of Cleveland's departed and returned football team, can attest to the importance of being acquainted with the Forest City. Yes, by the way, Cleveland's nickname is "The Forest City." This despite having repeatedly lit the Cuyahoga River on fire. Is it at all inauspicious that the news of the Future VFR should come so closely on the heels of the death of Jesse Helms? AND Bozo the Clown? Chuckle, chuckle, chuckle. No. First of all, unlike homosexuality, racism isn't something that can be taught - you're either born with it or you're not. So Baby VFR won't suffer from the lack of a Jesse Helms in the world to steer him/her toward a life of happy, gun-toting broad-mindedness. But I will say this tired, predictable thing about the death of Bozo the Clown: he certainly leaves some big shoes to fill. 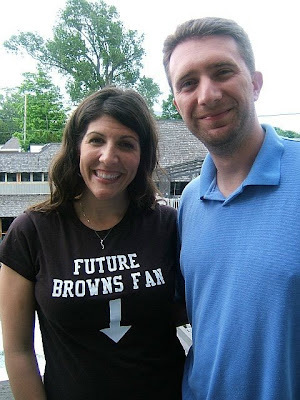 Something to shoot for, Mr. or Ms. Future Browns Fan. There is a character in my eventually forthcoming novel who shares a last name with the VFR family, and whose first name comes directly from a conversation Pete and I once had about what we would name our sons if we ever had sons to name. That name, Nick, has since been almost violently objected to by Mrs. VFR, so Nick lives on only in the fiction I have been weaving for years. Not that it would necessarily have been relevant in this case anyway, since my prediction is that the Soon-To-Be VFR is a girl. *Please note that the stork in question is not the same as The Stork®, the beloved comic book character popularly known as the "Scourge of the South" for the terror he wreaks on infants and expectant mothers, and as the nemesis of Lollipop the Bear, AND who is a registered trademark of DC Comics and Hasbro, Inc. Just to emphasize again, this is not that "the stork." I learn something new every day, not having known prior to reading your entry that Cleveland's nickname is "The Forest City." In some ways, it would be merciful for Future Child VFR to be of the female gender. Much like an Indian born into the lowest possible caste, a boy will inherit the fruitless burden of my obsession with the Brown and Orange. Have I ever told you why Nick is banned as a potential Baby VFR name? One day, I will perform an impeccable impression of my former landlord, Nick from Brooklyn, but for now I will give you a brief description...Nick would wait for me to come home from dates and say, "Ericka, why ya out so late, I been waiting for you..." Needless to say, he was creepy. Harmless but creepy. The name is forever ruined. Plus, you add Nick to our last name, and the kid is bound to wear a white suit and a feather in his hat. Thanks for the post. Baby VFR hearts Uncle Matty.